Everybody who visits Peru wants to go on Machu Picchu tours and for good reason, but there are a few things that tour guides don’t want you to know before you go. Find out what your Peru tour operator hasn’t been telling you! Who doesn’t want to visit the Lost City of the Incas on a trip to Peru? This ancient wonder from a past civilization is both majestic and mysterious, which is why Machu Picchu tours are one of the most sought after tours with any Peru tour operator. But when you’re booking Machu Picchu tours, there are few things that your Peru tour operator and the local tour guides won’t tell you during your visit. 1 Machu Picchu isn’t the “real” Lost City of the Incas. Machu Picchu was discovered in 1911 by Hiram Bingham III, but he was actually searching for a different city thought to be the hidden capital of the Incas called Vilcabamba. Three families were still living in Machu Picchu when Bingham first arrived, so it’s not even clear whether this city was considered to be lost. The city he had actually been in search of is now thought to be about 50 miles west. 2 Food and drinks are in short supply when you head out to Machu Picchu, and they are very expensive if you purchase them there. Pack your own lunch, a few snacks and plenty of water to save some money and have the food and water available when you need it most. 3 Signage throughout Machu Picchu tours are either nonexistent or poor, but there is a small museum nearby that you can visit on your own. Called Museo de Sitio Manuel Chávez Ballón, the museum has displays in both English and Spanish and can provide you with information that the tour guides and the signage didn’t. The museum is located at the end of a dirt road that is near the base of the city. 4 There is a second peak you can climb. Often called Machu Picchu Mountain, this is the peak that sits opposite of Huayna Peak. It’s twice as tall and gives a spectacular view of the surrounding area, including a view of the Urubamba River that Huayna Peak just can’t provide from its location and elevation. Plus, there aren’t restrictions on how many can go up Machu Picchu Mountain per day, so you don’t need to book ahead with your Peru tour operator. 5 Weather is unpredictable. Your Peru tour operator may tell you that you’ll be visiting during the low-water season, but light rains are still common, especially in this area. Pack a rain jacket or umbrella before you get on the bus for Machu Picchu tours just in case. 6 The names of most areas you’ll see on Machu Picchu tours often have no relation to their actual purpose. Like the Great Cavern and the Temple of the Moon, the actual purpose of these areas is unknown so the names are arbitrary, or guesses at the best. Machu Picchu offers as much mystery as it does beauty, and these six facts that your Peru tour operator won’t tell you doesn’t take away from the experience of visiting this location. 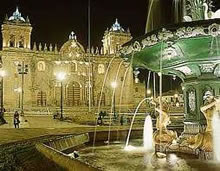 On the contrary, it can enhance your appreciation of the history and splendor of this Inca city. To learn more about Machu Picchu tours and what a Peru tour operator can do for you, email info@bestperutours.com. Best Peru Tours is a U.S.-based, licensed and insured Peru tour operator dedicated to provide all-inclusive and customizable tour packages that can include Machu Picchu tours and much more.